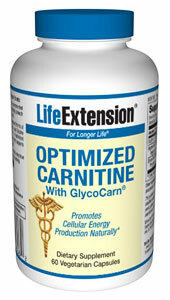 L-carnitine is an amino acid derived nutrient, which is critical for life. It is produced in the liver & kidneys predominantly from dietary components in meat & dairy products. It can also be manufactured in the body from other precurser nutrients. These are the amino acids lysine & methionine. Also adequate amounts of iron, vitamin B, vitamin B6, vitamin B3, and vitamin C plus the enzymes needed for conversion. A deficiency of any of these components can promote low carnitine. Both Acetyl-L-carnitine and L-carnitine are absorbed into the bloodstream efficiently and are effective in carrying fatty acids across the membrane into the cell where fatty acids are burned as energy and utilized efficiently by the mitochondria (the energy producers of the cell). Mitochondria are specialized sub units within cells. Their main function is to generate energy from food molecules, but they are involved in several vital cell processes. Improves memory, attention span, & mental performance in normal individuals. Alleviates stress, frustration, and tension. Improves blood flow to your brain & heart. Helps maintain healthy brain cells, maintains nerve growth factor & helps nourish brain cells. Improves communication between the right & left side of your brain. Promotes healthy male sexual function and virility. Provides safe and effective support for fat burning. Enhances the weight control benefits. Helps boost mitochondrial energy production. Helps maintain optimal mitochondrial function (central components of our cells that generate the majority of our energy from nutrients). Significantly increase peak running speed, total work load, and VO2 max in athletes compared to both placebo and individual carnitine ingredients. Be much more effective than both placebo and individual carnitine ingredients at helping adults recover from physical, mental, and emotional fatigue. For some people, L-carnitine, especially acetyl-L-carnitine, may have a stimulating effect. Therefore, it may be unwise to take it in the evening. DIRECTIONS: Take two capsules once or twice daily, or as recommended by a healthcare practitioner. This product can be taken on an empty stomach with water or juice in the morning in divided doses or all at once. Other Ingredients: vegetable cellulose (capsule), dicalcium phosphate, silicon dioxide, vegetable stearate.